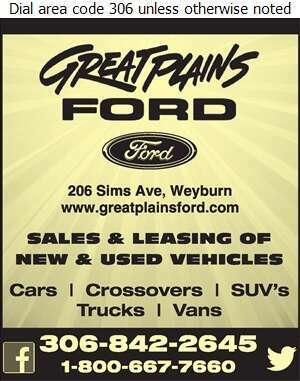 For superior sales and service visit Great Plains Ford Sales (1978) Ltd. At Great Plains Ford, we offer sales, service, parts and leasing on many makes and models. Stop in today and test drive one of our new or used cars, trucks, SUVs or crossovers. We also carry a selection of hybrid, electric and commercial vehicles. Our friendly sales professionals want to see you drive away in the vehicle that is right for you. Whether its power, performance, comfort or versatility you're looking for, our Fords have them all! We also offer a full auto body shop for all your repair needs. Our services include complete collision and frame service, expert refinishing, glass service and more!